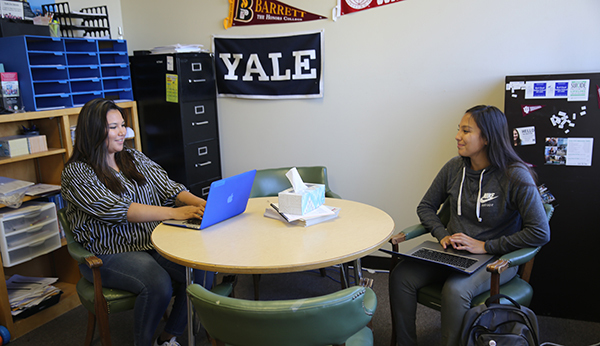 Once students themselves, Red Cloud graduates are now taking on leadership roles across the school—as teachers, coaches, counselors, administrators, and more. Today, 25 percent of Red Cloud’s employees are also Red Cloud graduates. And they are serving as powerful role models for the next generation. 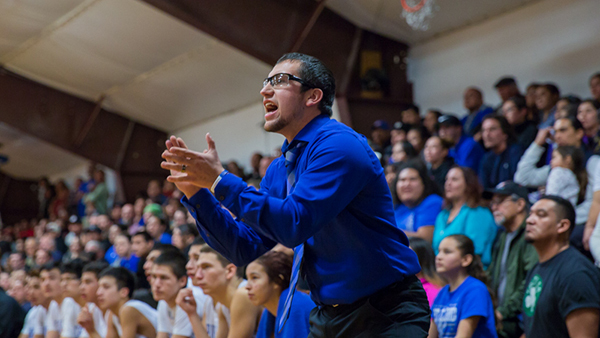 Seven years ago, when Red Cloud graduate Christian McGhee ‘08 returned to campus to serve as athletic director, he knew he’d landed his dream job. As a student at Red Cloud, Christian’s passion for basketball had given him a sense of purpose and discipline, and set him on a path to earn a full scholarship at Chadron State College. Returning as athletic director allowed him to do what he’d always wanted—to help the next generation of Red Cloud students reach their goals, on the playing field and beyond. 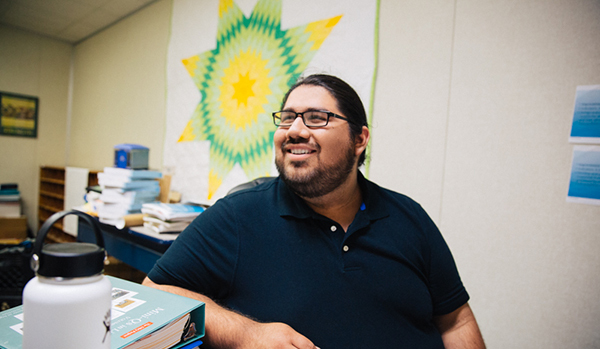 Almost a decade later, Christian has served as a mentor and source of support to countless Red Cloud students, helping to guide them through the challenges of growing up on the Pine Ridge Reservation. It’s a role that he—and the many other graduates who have returned to serve as Red Cloud staff members—are honored and humbled to play. “I think it’s very important that Red Cloud graduates are here on staff to help guide current students, and to show them that we say they can do they dream of doing because we’ve done it ourselves,” said Christian. Christian is one of dozens of alumni who have returned to Red Cloud after earning advanced degrees over the last decade. Today, 25 percent of Red Cloud’s employees are also alumni—serving as teachers, counselors, coaches, advisors, and more—and that number that continues to grow every year. And regardless of what role they play on campus, these alumni are all committed to “completing the circle,” by helping the next generation of Red Cloud students fulfill their potential and achieve their dreams. 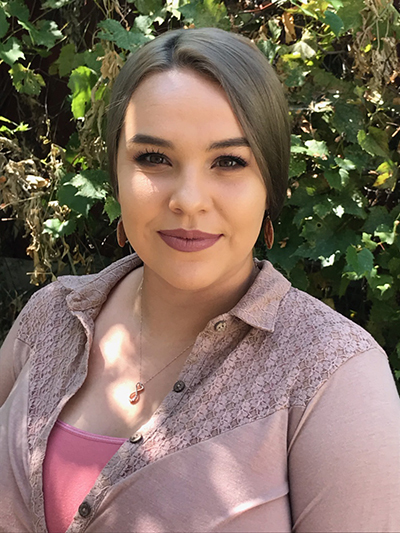 After studying social work as an undergraduate student, Ethleen Cournoyer ‘10 chose to return to Red Cloud to be a school counselor. The compassion and support she found during her time as a Red Cloud student had helped to survive the most traumatic loss of her life—the passing of her mother between her sophomore and junior years of high school. She wanted to share that same compassion and support with current students. And being a graduate herself, she says, helps her understand the complex challenges facing them. Today Ethleen is pursuing her master’s degree at Creighton University. She is deeply committed to using her knowledge to help current students thrive—and she knows that seeing Red Cloud graduates become leaders on campus is having a powerful impact on them. Maka Clifford ’05 traveled across continents after graduating from Red Cloud in 2005—but he always knew he’d return home to make a difference in his community. After college in San Francisco, teaching abroad in Japan, and earning his Master’s Degree at Columbia University, Maka felt drawn to return to Red Cloud because of the “powerful and positive” experience he had here as a student. He began by teaching social studies and history—and today he serves as Red Cloud’s Director of Curriculum and Assessment. In this role, he is constantly drawing on his experience and perspective as a former student to help current students explore their own unique talents and reveal opportunities they might not have ever imagined. In his new role helping to guide academics at Red Cloud, Maka sees the increasing number of Native educators teaching in the classroom as crucial to students’ success. During his time as a student, the Lakota classroom teachers on staff only taught subject matter relating to Native history, culture, or language. When Maka began teaching in areas beyond those, like world history and geography, he says it had an extraordinary impact on students—empowering them in a whole new way. “When I started teaching non-indigenous subjects, some of the kids didn’t think that I was a Lakota person at first. I had to explain that I’m from Manderson, right here on the Pine Ridge Reservation. I was teaching about the entire world, but also providing indigenous perspective, and they were completely blown away by that,” said Maka. From her position as Red Cloud’s community relations coordinator, Rilda Means ’08 has also watched the school evolve as more and more graduates have taken leadership roles on staff. She says having her fellow alumni share their own unique skills with the next generation of Red Cloud students has brought a new energy to campus that gives her even more hope for the future. There was never any doubt that Rilda would remain firmly rooted in her community, no matter where she went. College was always her plan, but she knew that she would return home after earning her degree to be with her family and to serve reservation communities. She attended Black Hills State University so that she could pursue her studies while remaining close enough to home to help her mother care for her ailing grandmother. Although she explored the possibility of becoming a tribal attorney, she shifted gears to pursue a master’s degree in Lakota Leadership at Oglala Lakota College. And today, she is indeed playing a leadership role on Red Cloud’s Advancement team—helping to bring new visitors to campus, to guide their experience, and to spread Red Cloud’s story across the community, around the country, and beyond. With each passing year, Rilda believes that new energy on campus is continuing to grow, as more and more graduates return to Red Cloud. The impact they are having on the next generation, she says, is the very reason why the school was created nearly 130 years ago.